An architect’s rendering shows TJC’s new Rogers Palmer Performing Arts Center. Tyler Junior College has received a $3 million commitment from The Rogers Foundation to help underwrite construction of TJC’s new performing arts center. 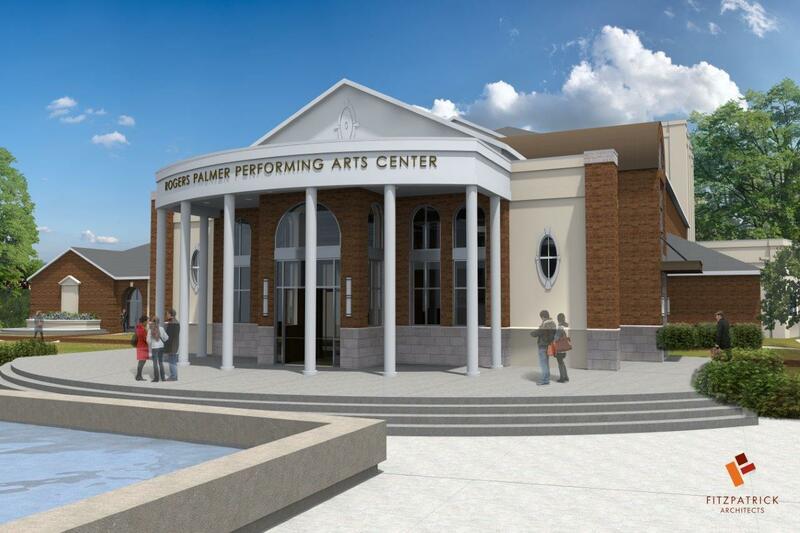 The current Wise Auditorium, located in the heart of the Cultural Arts District on TJC’s main campus, will be transformed into the “Rogers Palmer Performing Arts Center.” Groundbreaking is expected to take place in June. When completed, the comprehensive performing arts center will include more than 14,000 square feet of new space including a recital hall and art gallery, green room and rehearsal and dance studios, a larger stage and backstage with expanded dressing rooms, a new main lobby and all new technology. The new facility will ensure that TJC can continue to recruit exceptional talent, grow the College’s arts programs and help build a thriving arts culture for East Texas by offering high quality and accessible programming. In 1955, community philanthropist Watson W. Wise saw the need for a facility to host TJC’s burgeoning performing arts program. Along with a $300,000 tax-supported bond, Wise helped fund construction of a 725-seat municipal auditorium and accompanying classrooms. Wise Auditorium has been home to TJC’s performing arts programs since it opened in 1956. The facility serves the College’s creative and communication majors, which are second only to the nursing and health sciences. However, the current facility lacks the resources to support the ever-growing needs of the College’s vibrant performing arts programs which include The TJC Academy of Dance performances, vocal and instrumental recitals, theatre productions and Apache Belles and Band presentations. The auditorium has also hosted numerous activities of TJC, multiple events of local high schools and various visiting productions and programs for enjoyment of the East Texas community. In April 2018, The Campaign for the Performing Arts was launched to provide $7.5 million in private funding to underwrite the new construction. Sheryl Palmer and Margaret Perkins serve as co-chairs of the steering committee that also includes local community members: Teresa Butcher, Beryl Cobb, D.M. Edwards, Amy Faulconer, Annette Findley, LaVerne Gollob, Tisa Hibbs, Joyce Hudnall, Laura Hyde, Allison Kay Jarvis, Pam Lisner, Holly Mazzare, Amy McCullough, John B. McMillan, Dr. Laura O’Halloran, Jan Payne, Leanne Priest, George Ann Reed, Anne Rhodus, Dr. Cheryl Rogers and Michael Rogers. In recent years, Wise Auditorium has been the host venue to welcome back famous alumni who got their start at TJC, including Grammy Award winner Chris Tomlin, Hollywood actor Shea Whigham and former NSA Director and CIA Deputy Director Admiral Bobby Inman. For further information concerning The Campaign for the Performing Arts, please contact Mitch Andrews, Executive Director of Institutional Advancement and the TJC Foundation, at (903) 510-2249 or mand@tjc.edu.